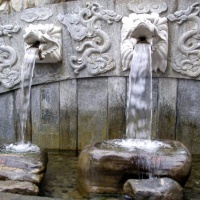 The Butterfly Spring is situated at the foot of Yunnong Peak of Cangshan Mountain. 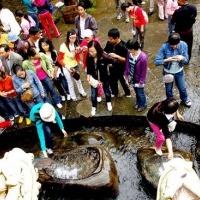 The water here is crystal clear and the place where the spring bubbles up attracts people with its tranquility. Legend has it once upon a time, a beautiful and industrious maiden by the name of Wengu lived beside the pool. One day the local despot caught sight of her and, stunned by her beauty, wanted her as his eighth concubine. The girl turned down, but Xialang, drowned themselves together in the pool. All of a sudden, a crack appeared in the bottom of the pool and a pair of butterflies flew out. They danced and pursued each other; a host of butterflies of many kinds came to be known as "Butterfly Spring, hence the name. 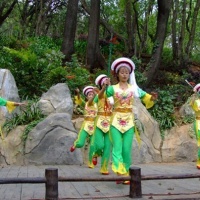 It is a fact that on the fifteenth day of the fourth month of the Chinese Lunar Calendar (Butterfly Festival of Dali), thousands of butterflies converge on the camphor tree, and many tourists come especially to view the spectacle.